Visually, they were right on point. 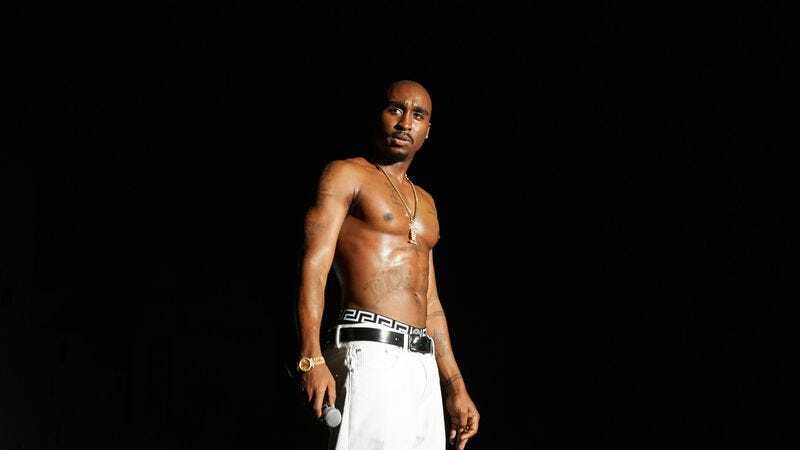 Demetrius Shipp Jr. looks almost freakishly like the late Tupac Shakur: the spheroid head and brilliant smile; those big, disarming eyes; his granite, tattoo-flecked torso. Perhaps the best reason to see All Eyez On Me is for his wardrobe, which is immaculately recreated. There’s the red-leather jumpsuit he wore like a ’90s Eddie Murphy, the exuberant paint-flecked denim jackets and hoodies from his underground era, and the mafioso getups he donned after Suge Knight started leering nearby. Filmed from the right angle—which the film’s pedestrian camerawork sometimes stumbles onto, perhaps by accident—Shipp looks almost uncannily like Shakur, better even than that hologram they marshaled out for Coachella in 2012. But like the hologram, Shipp lacks Tupac’s defining characteristic: his charisma. Few figures in the history of pop music are as tied to an indefinable “it” quality as Pac was—a transportive, supernatural magnetism that formed an invisible chord with listeners and fans, even today. (It’s why Kendrick fashioned his 2015 masterpiece as an album-long prayer to him.) Pac was, over and above anything else, a performer, an orator of rare magnetism and empathy. Notorious B.I.G. was a fabulist and a lyricist, so merely propping a Biggie-like figure on camera and letting the music do the work was a fine enough idea for 2009’s Notorious. N.W.A. possessed enough feuds to keep Straight Outta Compton moving, and its music’s revolutionary spark merely needed a little bit of context to feel resonant today. But if you’re going to make a Pac biopic, you need someone who does more than look a lot like Tupac Shakur. You need Pac-like charisma. Walk The Line, facing similar stakes, cast a generational talent in the role, but Shipp is no Joaquin Phoenix, and All Eyez On Me fails accordingly. Of course, Ice Cube’s son wasn’t Ice Cube, either, but All Eyez On Me marries this fundamental conceptual failure with a turgid, fussy script, inept stagings of both violence and interpersonal tenderness, a fussy double-framework narrative, and countless bizarre casting decisions. (Nobody has found a good surrogate for Snoop Dogg, but the weirdly cowardly interpretation of him here, with dialogue that seems to have been recorded by a different actor, may be the worst yet.) The film begins with Pac’s mother, the Black Panther Afeni Shakur (Danai Gurira), being released from prison while still pregnant with Tupac. From there we follow Tupac from New York to Baltimore—where he befriends a young Jada Pinkett (Kat Graham), who will show up to scold him occasionally throughout the film—and then to Oakland, cutting scene by scene between this backstory and a prison interview. In both settings, Shakur acts as a vacant observer of his own history, blithely explaining plot points and motivations like an animatronic exhibit about himself. When tasked with showing flashes of Pac’s charisma, Shipp plays it giggly, fussing over a Rolex watch with docile idiocy. 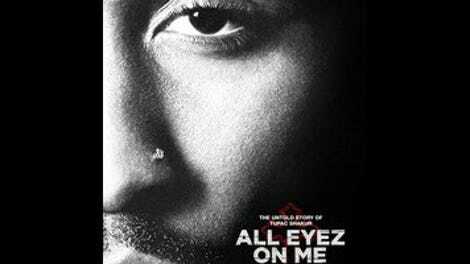 Eyez is on sturdier footing when it acts more as a documentary: the old music still sounds great, of course, and the film’s attempts to hold Shakur’s life up against the revolutionary politics of his mother show flashes of a better movie that more fully tackles his complex legacy. There’s a quick, insightful juxtaposition between the moment he got his subversive “thug life” tattoo (which stood for “the hate u gave little infants fucks everyone”) and the fact that his single at the time was the hedonist anthem “I Get Around.” But this theme is washed away in a flood of competing plot threads. The second half devolves into a sort of chamber drama, with small groups of characters meeting in poorly furnished rooms to deliver terse bursts of biography: Death Row Records; various legal problems; his feud with Biggie (played again with somnambulant disaffection by Notorious’ Jamal Woolard). One sequence stretches the tensile strength of the biopic concept to the breaking point, as Tupac meets Dr. Dre, promptly writes and records “California Love,” witnesses Suge Knight (Dominic L. Santana) murder someone, and then walks into another studio to write and record “Gangsta Party,” all in rapid succession. Biopics always feature a disbelief-testing sense of compression, but at least the music is always good. It is here, too, although the live performances seem to have been shot in one afternoon in a half-full lunch room, with copious cuts to waving hands and nodding heads taking the place of an actual audience. Some of this can have an unintentional comic effect: One love scene fades in on the line “Let’s make this our forever,” and, while watching Pac’s screen debut in Juice, his friend turns to him and says, “Pac. That’s amazing Pac. You really are on your way,” before they fist-bump and the scene changes. In all, though, the film is a missed opportunity for a life and talent that could’ve made a much better entry into the burgeoning genre of rap biopic. These movies succeed because, for rap-illiterate audiences, they provide a sense of context to properly enjoy some of the most important and powerful music of the past half-century, and for rap-literate audiences, they provide a sort of superhero-origin story for long-cherished figures, a chance to briefly hear memorized songs with fresh ears. At this most perfunctory level, All Eyez On Me succeeds, but on pretty much every other one imaginable, it is a failure.